Discussion in 'Guitars in General' started by fuzzface71, Apr 21, 2008. Are they for 12 string guitars and acoustics? I was planning to put one on my Les Paul. Any opinions? Would it be weird? My Anderson tele uses them 6 in-line although the buttons look a little different. Great tuners IMO. Not sure how they would look or fit on a LP 3 per side. Anyone else use them on their LP? I have them on my '86 SG and luv 'em. Can you please post a picture of your SG's headstock? I wanna see if it would look too weird having minis. Thanks! I will as soon as I get home. Aren't they 18:1 ratio instead of 14:1 on the full size Rotomatics? A friend of mine put mini's on his Epi double neck, 12 string neck only. This is the only pic I have at work, I can take a closeup when I get home. Cool thanks, if you can get a head shot that would be perfect! I put the regular Grover Rotomatics on my Ibanez Artist ... I think the headstock angle would be the same or similar to a Lester and it's a 3-a-sider. They work really well ... stay in tune, very precise and are the easiest tuners to change strings with that I know of. The only thing to note is that they aren't staggered and the string posts are quite long, so when you first change over, they stick up from the headstock more than your original's did and the break angle, with no string wound around the post (which is the aim, but you can still wind around the post if you like) the break angle over the nut on the E strings will be less than you had before. It didn't affect the tone or sustain of my guitar at all ... just looked slightly odd for a day or two. Sorry for the delay. Here are some head shots. 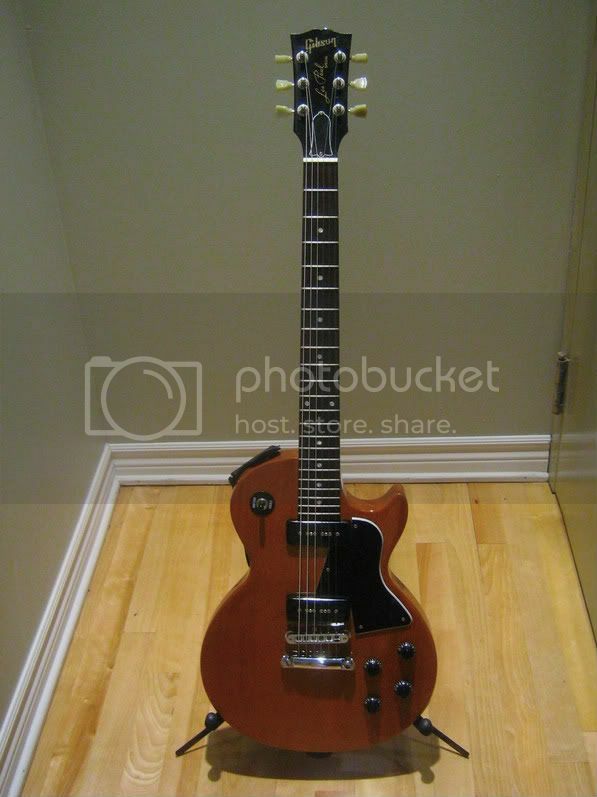 Your SG's headstock is a bit wider than a regular LP Special like mine. I heard that I might have to widen the holes or something? Can I do this myself (installing the machine head)? I would have an expert do it, that's because I have screwed up enough nice things in my life to know what I can and can't do. Its probably not that difficult if you have the tools (I don't). I think they'd actually look better on a smaller headstock, go for it! I agree with the above comment that they are very easy to re-string. I installed the minis on an Edwards Jimmy Page relic. They were a huge upgrade over the stock tunes and also reduced a bit of mass from the headstock. They also came stock on my Briggs Avatar. I think they are as good a quality tuner than anything else out there. Highly recommended! Edwards JP relic? Can I see it? That sounds cool? I've never seen one! You don't mind posting the other side of the headstock? Thanks! Yeah, I won't even dare to do it myself. Is there an improvement in the Hipshot design by virtue of it being newer ? Any other pros and cons ? Looking at either for a strat.